The image above is from a video taken by Steve Winkworth at Nelson Bay. 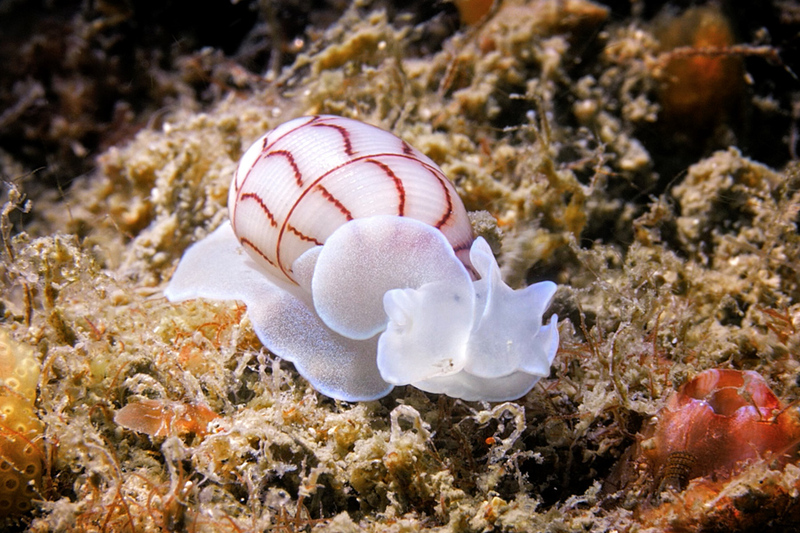 The animal is a marine snail called Bullina lineata, also known as a bubble shell. Here is the first half of the video. The bubble shell, wandering, finds itself in a field of skeleton shrimp. These tiny beasts, not really shrimp but amphipods, have two large talon-like claws. The skeleton shrimp strike at the snail, which flinches and recoils. What looks like an especially vigorous stab, at the 14 second mark, elicits an especially strong response. The snail backs up, starts to feel for a way round the sea of claws. An irresistable question, though a difficult one, is whether the snail feels these stabs and pinches, and experiences something like pain. The snail’s behaviors certainly look like consequences of a pain-like experience; the flinches are vividly recognizable. But what it might feel like, if anything, to be a bubble shell under assault by skeleton shrimp? Over the last few years, a lot of thought has been put into questions about whether various arthropods – especially insects and crustaceans – might be able to feel pain, and whether they feel anything at all. Not as much work, even speculatively, has been done on gastropods, the group that includes the bubble shell. Gastropods are molluscs, along with octopuses, who have been discussed a fair bit in this connection. But octopuses do not have typical molluscan nervous systems. Gastropods include Aplysia, a large slug-like creature (actually a snail with a small internal shell) that is an important “model organism” in neurobiology, with a much smaller nervous system than an octopus. A lot is known about learning in Aplysia, including some kinds of learning by reinforcement – learning by tracking the good and bad consequences of actions. That is intriguing, though what has been shown is a very simple version of that kind of learning. * Gastropods, like most animals, also have nociceptors, nerve cells that detect damaging stimuli as they occur. But the cautious view of many in this area (and just about everyone sensible is cautious) is that there can be nociception without experienced pain, as in some cases the nervous system circuits that make use of use nociception are simple and reflex-like. If so, it becomes likely that the Bubble Shell did feel the assault above. Some more of Steve Winkworth’s video is below. Here we see just the skeleton shrimp, in a lot more detail. I have written about those animals before on this site and taken a few dim shots of them, but nothing like what Steve, with superior skills, gear, and patience, has been able to achieve here. Thanks to Steve Winkworth for permission to use his video. 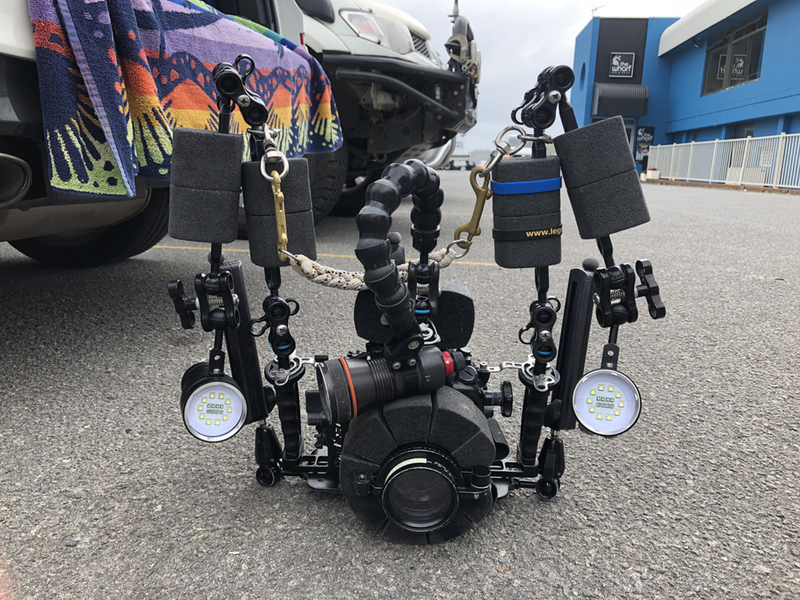 He has a long-running series of underwater videos on his YouTube channel. * There is a small but interesting tradition of argument that holds that reinforcement learning might have special significance as evidence for pain in animals – this idea has been discussed by Colin Allen, Robert Elwood, and others. But the kind of reinforcement learning that has been seen in Aplysia is a very simple kind; I am not sure it’s even the right kind according to views like Allen’s. Another philosopher, Eric Schwitzgebel at UC Riverside, has a paper in draft about consciousness in snails, using a land snail as the target case. The paper is here. Eric’s main theme is not snails per se, but the difficulties we face in making any headway at all on a question like “are snails conscious?” He thinks that when we try to answer this question using the theories of consciousness that now exist, our answers are “inevitably question-begging and rely partly on dubious extrapolation from the introspections and verbal reports of a single species.” At least in the long run, I am not so pessimistic. One option that Eric is much more skeptical about than I am – not so much a theory, but a feature of various theories – is that the presence of subjective experience (or “phenomenal consciousness”) in an animal is not a yes-or-no matter, but a matter of degree. I discussed this a bit in a talk at NYU given in 2017. Several people at that event thought that it is flat-out impossible that the presence of subjective experience is a matter of degree. This will be a theme in the book I am writing that follows up Other Minds. From Instagram: Doto nudibranch versus skeleton shrimp. If you write a comment on the post from this front page, the letters will look very small as you type. Write from here to avoid the problem. This entry was posted in Arthropods, Bodies and Minds, Marine life, Nervous Systems and tagged Gastropod, pain, qualia. Bookmark the permalink. Beautiful way to introduce us to Walter’s paper and what it could mean to the evolution of consciousness. In that NY meeting, I learnt about the ideas of Joseph E. LeDoux about the awareness of fear. If I understand well that position, (what I would catalogue into “theory of constructed emotions”; i.e. emotions are learned through experience and without that, we can have the response but not the feeling), what Walter is proposing here is quite similar, right? But instead of using an ontogenetic development framework, he is focusing on evolutionary development of that process. Your note has me doing a bit of reading, looking into what LeDoux says. I think the perspectives are somewhat different, though I am not sure, and part of the uncertainty is due to the central puzzle in this whole field — how we can have scientific evidence for subjective experience of a certain kind. LeDoux in at least some recent work (‘Semantics, Surplus Meaning, and the Science of Fear,’ Trends CogSci, 2017), emphasizes separations between the circuits mediating fear-related behaviors and the basis for experience itself: “the dual-circuit approach, which separates circuits underlying fearful feelings and defense responses, accounts for certain puzzles in the field [7,13]: (i) subjective experiences of fear and anxiety do not correlate well with measures of behavioral and physiological defense responses; (ii) patients with amygdala damage do not exhibit physiological defense responses to threats, but still can feel fear and panic; (iii) threats processed nonconsciously increase amygdala activity and trigger peripheral physiological responses, even when the person remains unaware of the stimulus and lacks feelings of fear….” I was cautiously interpreting Walters as suggesting that a felt basis to the cognitive processes he investigates does make sense as a postulation, without something like a ‘second circuit,’ (in a context where the brain mechanisms are different, too) but I am not sure that this is right as an interpretation of his paper.